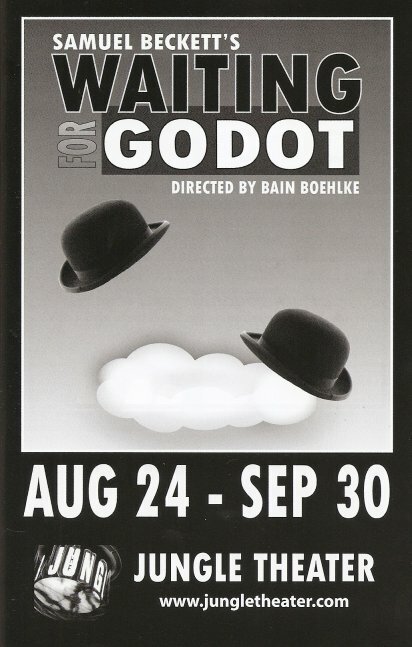 Samuel Beckett's classic Waiting for Godot is an amusing, perplexing, delightful, profound, absurd little play (literally, "absurdist" is the genre to which the play belongs). I've heard of it of course, but only in vague terms, so I wasn't sure what I was getting into when I saw it at the Jungle Theater earlier this week. But I knew that in the hands of Director Bain Boehlke and two of my favorite local actors, Nathan Keepers and Jim Lichtsheidl, I was in for a treat. And I was not wrong. It seems appropriate to structure this blog post as a serious of random bullet points rather than a cohesive summary, so that's what I'm going to do. Nathan Keepers and Jim Lichtsheidl star as Estragon and Vladimir, aka Gogo and Didi, two old friends who are standing by a tree, waiting for the owner of the land to appear and pass judgement on them. As they wait they converse about silly and profound things. Both Nathan and Jim are very physical actors, and not a single movement (or non-movement) is wasted. To watch them together is a joy. I've seen them individually many times and always enjoyed their performances, which are always so different and specific. But I don't believe I've ever seen them together. It's twice as wonderful. They are endlessly entertaining; I could watch them blather about nothing for hours. Which is kind of what this play is. But it's a meaningful nothing, if you choose to see it. When this play was first produced in the mid-20th century, audience members walked out of the theater in the middle of the play. Even at the Jungle, I noticed a few more empty seats in the second act than there were in the first act. I think it's the kind of thing that you either get and love, or you don't get it and it's interminable. I fall in the former category. Gogi and Didi are visited by a man named Pozzo, who is leading another man, his servant, on a rope. And that's when things get really weird. The servant speaks only in grunts and pants, until he is told to think, at which point he begins to speak endlessly and articulately about nothing. Allen Hamilton as Pozzo and Charles Schuminski as the grunting servant both give excellent performances, but I found myself waiting for them to leave the stage so we could get back to Didi and Gogo's explorations of nothingness. "Don't let's do anything. It's safer." In addition to directing (read a really interesting article about his process here), Bain Boehlke also designed the set. I've never seen the Jungle stage like this: completely bare and open so that you can see into the wings, with just a few pieces representing a tree, some grass, and a bench. The director frequently is also the set designer at the Jungle, which makes for a set that is perfectly in tune with the direction of the play. In this case - both are brilliant. "Astride of a grave and a difficult birth. Down in the hole, lingeringly, the gravedigger puts on the forceps." If you've never seen the play before, or even if you have, spend a few moments reading the program before the play starts. There are several short pieces about the play, the playwright, and audience reaction which may enlighten your experience with this odd little gem. From the playwright: "The end is to give artistic expression to something hitherto almost ignored - the irrational state of unknowingness wherein we exist, this mental weightlessness which is beyond reason." What else is there to say? 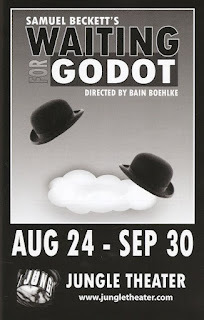 A classic piece of theater, with impeccable acting, set design, and directing. If you're a fan of the theater (and really, if you're not, what are you doing here? ), go see it. Playing at the Jungle Theater now through the end of September.